When does a story become a story? Could it be when it comes to the attention of the London media? The stick rattling my cage is an Observer article where the interviewer has discovered – in a style akin to a 13-year-old girl meeting The Biebmeister – Richard Parks. Now, Parks is someone I’ve learned a lot about in a short time since moving to Wales, as everyone here thinks he sits on the left hand of whatever their particular chosen deity is. To find out more about what he’s done, visit the 737 Challenge website although most people in Wales are not only aware of what he’s done, they are extremely – vocally – proud of him. Last week he came into Media Wales to do a Q&A liveblog and the response was phenomenal, with people logging on from all over the world to pass on congratulations. But you wouldn’t realise that it was well-told story if you read the Observer piece, which you can do here. 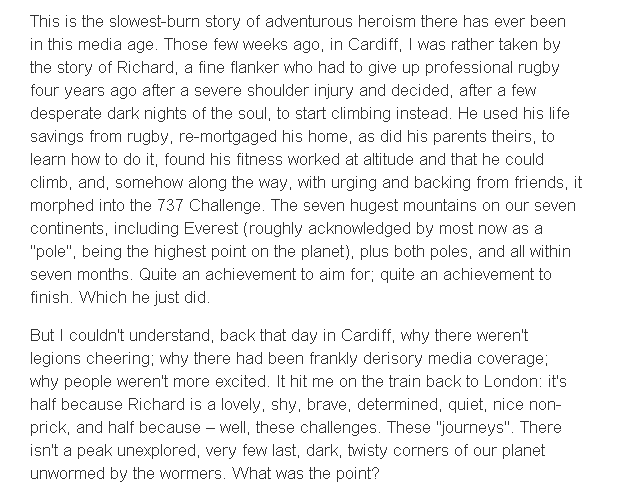 The points that particularly irked me (especially as I only heard about Richard Parks when I moved to Wales in January, and found everyone was in awe of him) were this…. Reader, I disagree with him. 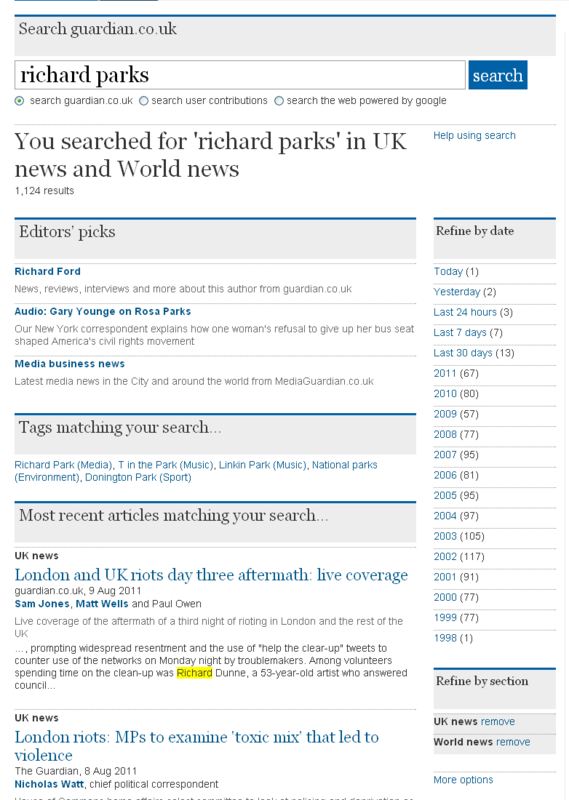 Richard Parks’ exploits have been reported on in near-forensic detail by Welsh MSM (and highlighted in the blogosphere, message boards and non-MSM, for that matter). Many of the Welsh papers have followed his achievements at least week-by-week; reporters from TV and print checked in with Richard or his pr representative daily, because there was huge appetite from readers to know how he was faring, when he was setting off again, if The Toe had succumbed to frostbite forever…. it was the most comprehensively reported case of frostbitten appendage in the history of such things, I suspect. Don’t take my word for it; you can see it on this page on WalesOnline, this page on thisisgwent.co.uk or just run his name through the internal searches for BBC Wales and ITV Wales for video reports . There are others, I’m sure, and I’ll update this as necessary. I don’t often get defensive but it’s unfair that the work of so many of Parks’ supporters (within the media and the wider public) is dismissed by a writer who dashed off some words about the lack of interest in Parks’ exploits without checking facts. Off the top of my head, these are some of the mainstream media in Wales who have followed Richard Parks’ 737 Challenge from the very beginning: BBC Wales – tv, online and radio – ITV Wales – online and tv – the Western Mail (the national newspaper of Wales, WalesOnline* (national news site), Wales on Sunday* (Sunday newspaper covering Wales) The South Wales Echo (regional evening newspaper), the South Wales Argus (regional evening newspaper) and its companion website, the Gwent Gazette (weekly newspaper) and the Pontypridd and Llantrisant Observer. This is not “frankly derisory” media coverage. London-based press and broadcast media may not have paid much attention until Richard Parks finally scaled his last peak but that doesn’t mean it didn’t exist. I can’t remember the last time I wrote a ‘check your facts’ blog post but the Observer is seriously wide of the mark with this claim and it deserves redressing. I may work for Media Wales but I still consider myself outside-looking-in on the Richard Parks story; it started before I got here and everything I know about the challenge, I’ve learned from talking to people in the office, reading articles in the Welsh press, watching the excellent documentary on BBC One Wales, and following the 737 Challenge blog and tweets. Local press (and local tv and radio) are frequently in at the sharp end long before London shows up to let us see how it should be done; I guess local bloggers and microbloggers are there before all of us. It would be good if the foodchain (in both directions) got a little more acknowledgement.